Discussion in 'Dovetail Live Article Discussion' started by TrainSim-James, May 17, 2018. 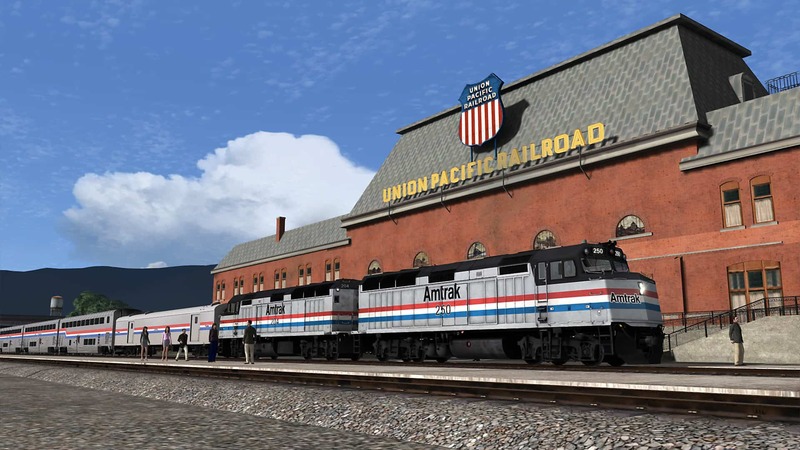 Now available, Train Simulator’s Salt Lake City Extension delivers new railroading experiences in the American West! I bought it! And I sure am excited! Now only to wait for the GP40-2! So far I've only driven the California Zephyr scenarios. The route performed well during the run. Naturally frames dropped around Salt Lake, but that's to be expected since Salt Lake is a big city. Even then the frame rate on my computer didn't drop too much. As I was cruising along at 70mph I honestly thought "This is the Soldier Summit I signed up for back in 2015!" Scenario-wise you could model something prototypical until about 1986 when the UP station at Salt Lake was closed and the tracks removed (the UP depot was closed before the D&RGW depot). You could even simulate passing the original California Zephyr from the WP to the D&RGW at the D&RGW depot for example. Any scenarios featuring modern UP power would still be best served on the original Soldier Summit route which is still there after the download - I thought the extension would have overwritten it, which means I bought a whole other route for like $18 or so (granted you have to own the original route first before you can buy the extension). My only real gripes are a few minor ones so far, and I haven't played through all of the scenarios yet so I may find more. First off, the scenario author didn't bother providing an actual date in the scenario properties flyout (yes, I checked). The date reads July 1, 2010 which is the default date when you start writing a new scenario. I know the only real important thing is the month, but an actual date with appropriate day, month, and year would have been appreciated. I like those sorts of little details - it's one of my quirks. Second (a constant gripe of mine as of late) the language used in the scenarios so far doesn't strike me as real or prototypical. I like immersion in Train Simulator and nothing kills it faster than a message using words incorrectly or saying something in a way no actual railroad personnel would ever say it. Third you end the first scenario in a siding to allow a coal train to pass by. You never see this coal train as the next scenario begins immediately with the message that the track is clear. My question: why am I, a passenger train, getting out of the way for something as low priority as a coal drag? And which direction is it coming from? If it's coming from Salt Lake then that makes even less sense since it would be a train of empties which makes no money and would be even lower in priority in comparison to an express train and if it's coming up from behind how did it catch me? I'm an express thundering down the line at 70mph compared to a coal drag which would be lucky to make 10-15mph over the Wasatch range in real life so why am I waiting for it? If I needed to clear the way why not make it something more worthwhile like a trailer train? I would have been okay with that. And why not go ahead and start the next scenario with you waiting for the opposing train? It wouldn't need to be a long wait and it would give the player time to set up and feel comfortable before setting off, like turning on the headlights, turning on the instrument lights, setting the reverser, etc. It feels lazy that the opposing train wasn't even modeled, and since the road is clear and there's a schedule to keep it feels like I need to get this train moving ASAP otherwise I could lose time and irreversibly fall behind schedule. The consist for the California Zephyr, while the correct length for the time period, has the cars in the wrong order. All the sleepers are grouped together as are all the coaches, which looks tidy and is how Amtrak does it today, but it's not how the train looked back then. Back then the Zephyr was actually 3 trains in 1: the CZ (Chicago-Oakland), the Desert Wind (Chicago-Los Angeles via Salt Lake and Las Vegas) and the Pioneer (Chicago-Portland via Salt Lake). The actual CZ occupied the first section of the train: baggage, transition/dorm, sleeper, co.bagg, coach, lounge, diner. Following the CZ came the Pioneer, it having co.bagg, coach, and sleeper in that order. The end of the train was the Desert Wind made of another co.bagg, coach, and sleeper and in the Summer when ridership was higher an extra snack car or diner would be tacked onto the end of the train at Denver all the way to Los Angeles with the Desert Wind to help feed the extra passengers. Any other time of the year the extra diner would join the train at Salt Lake up to L.A. At Salt Lake the 3 trains split up and went their separate ways. So the consist should be: baggage, trans/dorm, sleeper, co.bagg, coach, lounge, diner, co.bagg, coach, sleeper, co.bagg, coach, sleeper, and extra diner since the scenario takes place in the Summer - 14 cars total. At least 1-3 additional baggage cars should be added to the front to simulate any mail and express traffic between Chicago and Oakland making the train upwards of 17 cars or more (Amtrak used to carry all sorts of mail and express back then - you almost never saw a long distance Amtrak train without a mix of several baggage cars and/or Material Handling boxcars on the head end). The train usually had 3-4 F40PHs on the point to power the train from Chicago to Salt Lake as it was the single longest train on Amtrak's system until it took over the Auto Train. Those are my only gripes so far. Nothing deal-breaking, but the devil's in the details and I love it when the developers include all the little details (as much as possible in Train Simulator anyway). Some great constructive feedback in there dwtrain21, I'll make sure this finds the right people in here so we can get better at this. Thank you so much for the time you've taken to provide this. I'm grateful my criticism is taken well. I'm a music student, so I'm used to receiving very blunt feedback in my performances from my professors, and some of the bluntness comes through when I give my own critique to others on various topics. It's not taken well sometimes, so I don't give it often on forums like this. To be clear I love the route. I just like to see those little historic and operational details incorporated into the accompanying scenarios. I haven't tested it yet. I had to do a verification of game cache and files. I was having a little difficulty. I got it yesterday morning and tested this extension all day. Optics and performance are absolutely top, as always with routes created by DTG itself. Hardly under 40 fps. Unfortunately I got stuck on the Quick Drive. Selections over the entire route in both directions are hardly possible and are always aborted by multiple error messages or you can still start and get while driving an AI collision or crashes even with an AI train. Short selections e.g. from Provo to Salt Lake City often work without errors. Unfortunately this is unacceptable and deceives the really great overall impression of the extension, especially since the Quick Drive is listed as a selling point. @ DTG do you test something not at all? The recognition value compared to Google Maps is given to me as a stranger, although it looks different in Real today. Very nice the highway bridges and the expansion in the Salt Lake City area. Also very great are the two stations, which are no longer in this form today and the DTG revives this, highlight. And of course the really big steelworks, that's what I call a factory! Through the factory, the entire route gets even a significant upgrade and accordingly the gaming experience. Unfortunately, the scenarios are not in my language. Why is that? Morristown and Gilroy were also multilingual. I would also spend a little more money if I got the tasks and manual in my language. The route should have earned 5 stars. Because of the language, I subtract one point and because of the Quick Drive another, so that it will be only 3 stars. Should fix DTG here I change my rating accordingly. If you are into US-Trains should definitely grab, clear buy recommendation. So far I have done 3 runs Westbound Zephyer Pt. 1-2 - found the headlight on the Amtrak not to be all that bright but was easy to control and brake. The other route was the Provo Empties no real issues other than the missing whistle posts on both routes. It's a great route to run! The only major problem I have is that when you're coming up on crossings in many areas, there are no Whistle Posts. So, you have to watch your surroundings to see if there's a crossing coming up. As a scenario creator who dosen’t have the knowledge of Rio Grande train numbers other than what I’ve read in articles, I would really like a definitive guide to D&RGW train symbols that ran over the Utah Division.